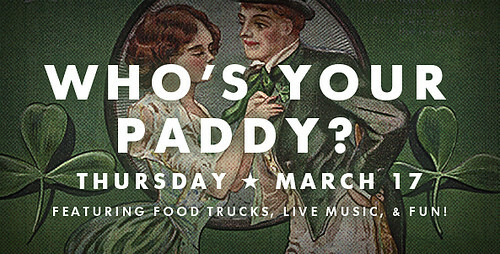 Image Courtesy of Big Boss Brewing Co.
Big Boss Brewing Co. in Raleigh is hosting their annual “Who’s Your Paddy?” St. Patrick’s Day Celebration next Thursday March 17th. The event will feature five local food trucks, live music, a potato decorating contest, and of course Big Boss beer! Announcing the 2011 Big Boss Potato decorating contest. As part of the Saint Patrick’s Day celebration the folks at Big Boss are asking you to Carve-up, dress-up and display your spud for all to see. Best potatoes should show an original concept and celebrate the season and of course beer! Deliver your fancy potato to Big Boss Brewing by the end of business on March 16th. Potatoes will be critiqued by a panel of judges and three prize packages will be awarded on Thursday the 17th around 7pm. Bring ID, Cash and a green attitude. Credit cards accepted at the upstairs bar only.Lawn chairs are welcome! For more information, check out the Big Boss website.